Both the Narrow Necked Ceramic Pot and the Bowl of Coconut Shell and Sliced Cinnamon Stick Spell Versatility as Objects of Decor. 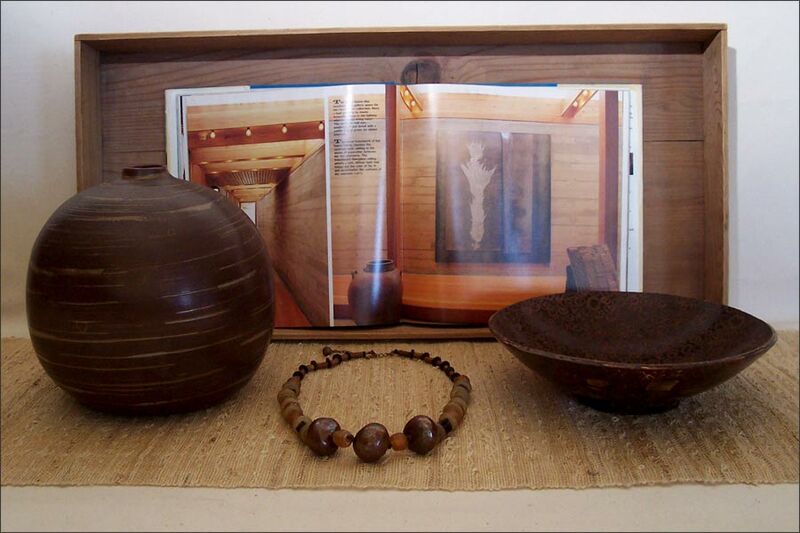 Both are Pictured Here with a Feature of a Guest House by Architect Jim Cutler in the Book - The Northwest American Design, by Linda Humphrey and Fred Albert. The Northwest Style Focuses a Great Deal on a Celebration of Clear Grained Woods, Often Combined with Concrete or Stone. The Shapes, Visual Texture and Earth Tone Coloration Works well with the Northwest Style. But Besides Working well with the Northwest Style, Either Pot or Bowl Could Combine with Asian Furnishings. As the Coconut and Cinnamon Bowl is Most Likely from Hawaii, Island Decor Might be Considered, or even Displayed in an Ethnic Eclectic Decor Setting. The Clean Lines of the Pot Could go Modern, Easily.